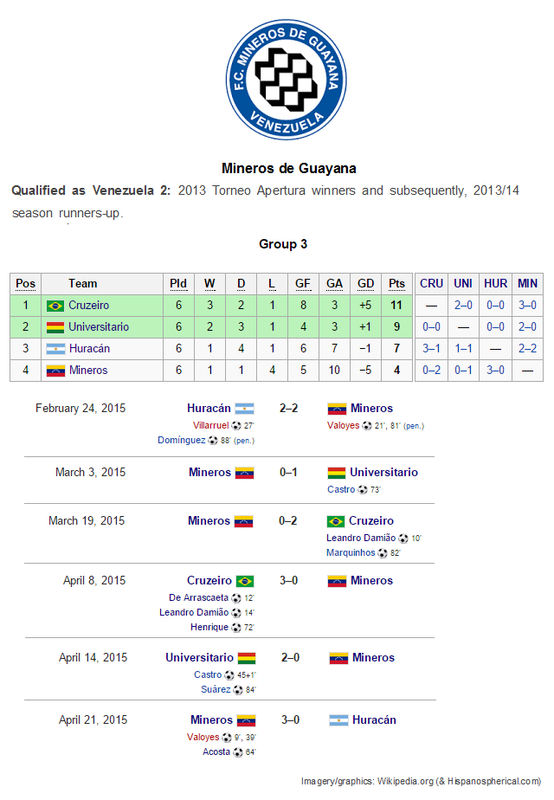 Despite being afforded little hope by most neutrals before the match, Venezuela’s Mineros de Guayana rode their luck in this Group 3 opener to come within a few minutes of taking away from Buenos Aires what would have been an impressive victory. 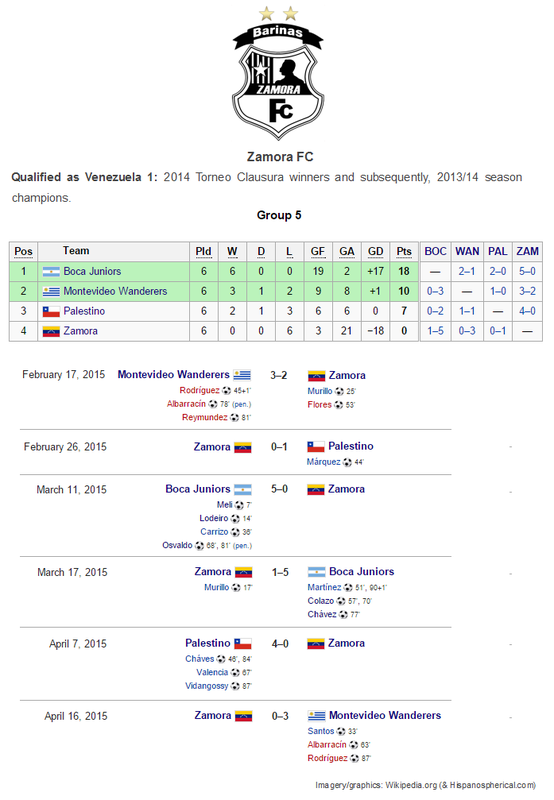 Although they possess several internationals in their ranks, domestically the most easterly side in Venezuela’s top-flight have been mired in some rather mediocre, mid-table form since finishing runners-up last May. They would have been right to feel apprehensive facing an Argentine side who, though newly promoted and playing in this competition for the first time since 1974, swatted aside illustrious Peruvian giants Alianza Lima 4-0 away from home in the Libertadores qualifying round. For the first twenty minutes, the game largely adhered to the script, with Huracán dominating possession with some neat passing play and testing the Mineros defence with long balls and crosses from both flanks. Goalkeeper Rafael Romo made some important, if expected, stops from leading striker Ramón ‘Wanchope’ Ábila and experienced playmaker Patricio Toranzo though was scrambling when the fabulous left-footed volley of youngster Alejandro Romero Gamarra rattled the crossbar, before trickling across the goalmouth. However, despite looking vulnerable at the back, Mineros did have a few forward forays, with that of recent international goalscorer Richard Blanco after 20 minutes, earning a free-kick on the left edge of the area after he was upended by a defender he had beaten for pace. Colombian forward Zamir Valoyes stepped up and, to silence the Globo faithful, curled a low powerful effort into the far corner that appeared to beat Marcos Díaz for pace. Mineros had a surprise lead. A little flustered, the hosts nevertheless continued as before, though were now looking to get back into the game – a pursuit with which the visitors were to unwittingly provide some clumsy assistance. Indeed, little over five minutes following the opener, a ball was slid into the centre of the area where Édgar Jiménez picked it up. With more time on his hands that he evidently was aware of, the much-maligned international hastily nudged it against Lucas Villarruel whose block rebounded the ball back to Romo. Unfortunately for Venezuela’s third-choice goalkeeper – and not for the first time in recent memory – he failed to collect a relatively straightforward ball, instead dropping it for Villarruel to pounce and nudge home. For the rest of the first half, the balance of play continued in the same vein as it had since kick-off, with Huracán putting in some crosses that tested Mineros’ nervy defence and getting a few shots on goal. The hosts did, however, receive a blow just before half-time as goalkeeper Marcos Díaz was injured and had to be replaced by Matías Giordano. This was especially disappointing for Díaz as he had been the shootout hero of November’s Copa Argentina win against Rosario Central, saving two of the three penalties the opposition failed to convert and thus securing Libertadores qualification for his side. Moving into the second period, barring a brief early spell, the hosts continued to dominate possession in the first 25 minutes. However, while the Argentines may have enjoyed most of the play and, at times, been encamped within the Mineros half, they rarely threatened the opposition goal. They must have sensed their Venezuelan foes were growing in confidence, something they could see with their own eyes when, with 20 minutes remaining, Mineros made a rare foray into the other half. On the inside-left, goalscorer Valoyes slid a neat reverse ball through for substitute Angelo Peña – a man with international caps and a stint in Portugal on his CV – who found himself one-on-one with Giordano, but hit his shot too close to the goalkeeper. From this moment onwards, the game turned into an end-to-end contest, something that was best encapsulated in a thrilling 30-second spell several minutes later. This started with Venezuelan international Blanco hitting the bar with a fine strike and then seeing the ball rebound to his La Vinotinto colleague Rafael Acosta who, from the edge of the area, hit the post with a good effort with the outside of his right boot. Before anyone could catch breath, the Argentines were up the other end where substitute and much-travelled recent recruit Daniel Montenegro then hit the crossbar. However, it did not take the Venezuelans long to go one better as in the 80th minute Valoyes, with Federico Mancinelli behind him, appeared to slip following minimal contact and was awarded a rather fortuitous penalty. The Colombian himself stepped up to convert the spot-kick, thus gaining his second goal of the game and giving his side a suprise lead that, pre-game, few outside of Venezuela were predicting. Alas, once again, a Venezuelan team were unable to hold on as with two minutes left, defender Julio Machado was adjudged to have hauled Montenegro to the ground in the penalty area. While it looked a little soft, many saw this as justice served and it was 36-year-old defender Eduardo Domínguez who held his nerve to ensure this game ended on level terms. Before the game, one senses Mineros de Guayana would have taken a draw and indeed their defence-minded tactics borne of Libertadores experience were certainly designed primarily to frustrate, with the hope of mounting a counter-attack every now and again. When Huracán began to run out of ideas, the Venezuelan side threw off their shackles and came within a few minutes of achieving a memorable win. Played on the same night, this group’s other fixture saw Brazilian champions Cruzeiro draw 0-0 against Bolivia’s Club Universitario, which, given the conditions, is not a point to be sniffed at. In their next match, they will be back in more comfortable environs in Belo Horizonte, where they will face Huracán, a game for which the sensible money will be on the hosts. Mineros thus will be at home to the Bolivian side, in a game that they really must win in order to feel that progressing from this group is a viable possibility. As always, check back here and/or at @DarrenSpherical for further updates on the Copa Libertadores campaigns of not only Mineros de Guayana but also Deportivo Táchira and Zamora, as well as a whole lot more related to Venezuelan and South American football. 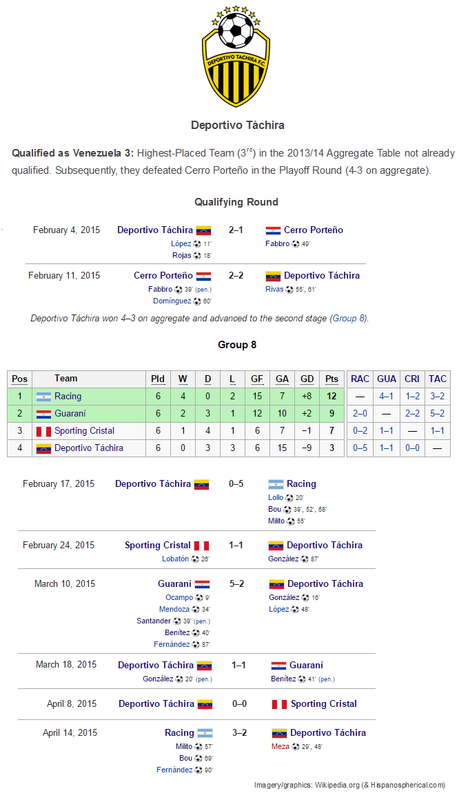 This entry was posted in Copa Libertadores and tagged 2015 Copa Libertadores, Alejandro Romero Gamarra, Alianza Lima, Argentina, Argentine Football, Édgar Jiménez, Buenos Aires, Copa Argentina, Copa Libertadores, Copa Libertadores in English, Daniel Montenegro, English Copa Libertadores Coverage, English Venezuelan Football, Globo, Huracán, Lucas Villarruel, Marcos Díaz, Mineros de Guayana, Patricio Toranzo, Rafael Acosta, Rafael Romo, Ramón Ábila, Richard Blanco, Venezuela, Venezuelan Football, Zamir Valoyes on March 2, 2015 by hispanospherical.